Eurocom Corporation (www.eurocom.com), a developer of long lifespan, fully upgradable Notebooks, high performance Mobile Workstations and Mobile Server has recently increased the 15.6” and 17.3” LCD Display choices in Eurocom systems as well as offering the displays as replacement options for users who desire to upgrade their viewing experience. The addition of displays provides customers with the perfect option to meet their exacting requirements. “Many customers are ordering displays to upgrade their existing systems, because their notebook maker doesn’t provide any alternative options. We are offering displays to improve the user experience for customers who are looking to maximize their investment. At Eurocom choice and options are king” explains Matthew Thompson, Eurocom Corporate Sales Manager. 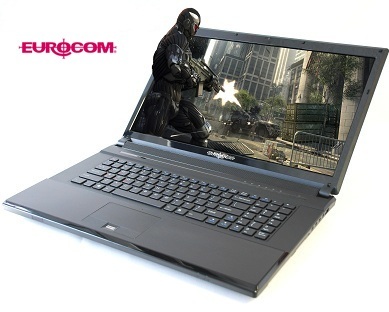 Since 1989, Eurocom has been offering a full line of upgradeable and customizable notebooks. At the time of purchase Eurocom notebooks can be customized based on Processor, GPU, RAM, Storage Drives, Keyboard Language, Wireless Card, Optical Drive and now LCD Display. While Eurocom will also be providing displays to individuals who already own a system but wish to improve their viewing experience. Eurocom offers display choices from several manufactures: AU Optronics (AUO), LG Electronics and HannStar. “Eurocom is always looking for new ways our customers can customize a system to suit their exact needs by offering as many options as possible. We have noticed for a very long time that one size won't fit all and various users require different levels of optimization, including displays from different glare types, NTSC Colour Gamut rating and Contrast, whether they be for design and engineering work, or gaming” said Mark Bialic, President of Eurocom. Display options are often overlooked by customers, but can be a major cause for user satisfaction based on specific requirements and needs. The added display options by Eurocom provide engineers, designers, gamers and business professionals the perfect display to fit their needs. Eurocom is also now offering customers the option to calibrate their display at time of purchase to ensure the display is optimized and representing true to life colours. Eurocom also offers 3D display panels along with NVIDIA 3D Vision Kit for an immersive 3D experience in games and movies.